Just as many folks can sleep more comfortably with the warmth provided by a blanket, some dogs may also require a specially-designed canine blanket to keep them warm especially when winter temperatures start dropping. While some dogs can sleep comfortably through a blizzard, there are some breeds like the Chinese crested, Greyhound, and Basenji that are very susceptible to cold weather. If you happen to have this kind of pet in your family, then getting the bet dog blanket for your pet is a must. 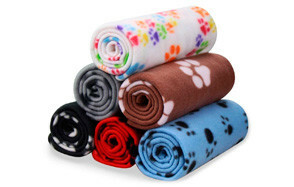 To help you zero-in on the perfect choice, we’ve listed herein some of the worthy dog blankets for your consideration. Available in 4-, 5-, and 6- pack variations, the Comsmart Warm Dog Fleece Blanket is a great choice when one is looking for a great combination of variety and affordability. Comsmart puppy blankets are designed to be used in a variety of ways and not just to keep your pup or bigger dog warm and comfy when it does get chilly outside. Most pet parents find the Comsmart to be especially useful in other situations as well. The fleece material is warm and cozy enough to bring comfort to one’s hound without necessarily burdening it with the weight of the blanket. That being said, the Comsmart might as well pass as a great alternative to dog coats on a chilly morning. 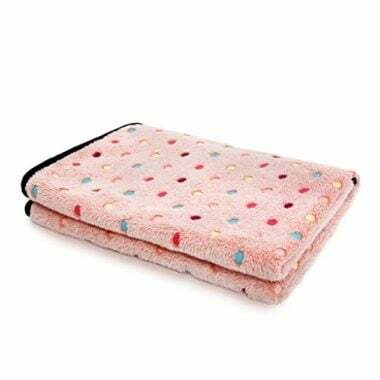 Allisandro’s premium flannel dog throw blanket is exceptionally thick because of its double-sided plush fabric. Regardless of how ‘active’ your hound is as a sleeper, it won’t matter as the Allisandro’s unique design is sure to generate warmth and convey this to your pet, making it sleep more comfortably. The decorative paw print design on the velvet fabric of the Allisandro is also noteworthy as it gives the dog blanket a luxurious feel. The edges are piped to help prevent fraying of the materials and keep together the integrity of the blanket. Because of the decorative elements of the Allisandro it can actually become a great alternative to dog clothes or even dog jackets. Pet parents consider the PetFusion as the best dog blanket primarily because of its very simple yet truly effective design. 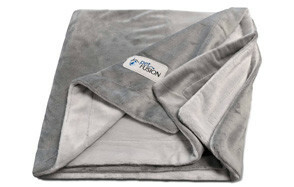 The PetFusion comes as an all-season, year-round comforter for canines. It is constructed of micro plush materials that provide warmth when needed and ample ventilation when it becomes exceedingly warm. Its dual-tone, fully reversible design also means pet parents can actually choose to use either side. Perhaps the best part of the PetFusion is that it is available in 4 sizes with the largest at 4 x 5 feet, big enough to bring warmth and coziness to the largest of dog breeds. 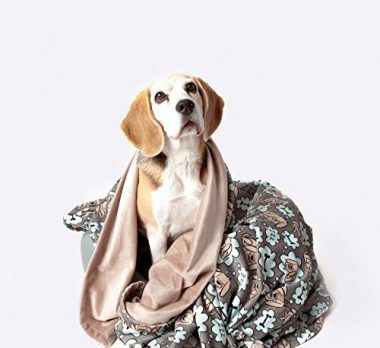 UTEX pet blankets look more like fancy pieces of fabric that comes with a taupe reversible side giving pet owners the chance to use either to match the prevailing mood in their homes. Its design is intended not only for winter use but also for summer comforting of pets. The fleece fabric used in its construction is also ideal for protecting a variety of surfaces, although it may not be able to protect that much when it comes to spills and accidents. While it is machine-washable, pet parents prefer washing it by hand to really preserve its plushness. Either way these dog and puppy blankets also make excellent props for that once-in-a-lifetime portrait shot of your dog if ever you need one. 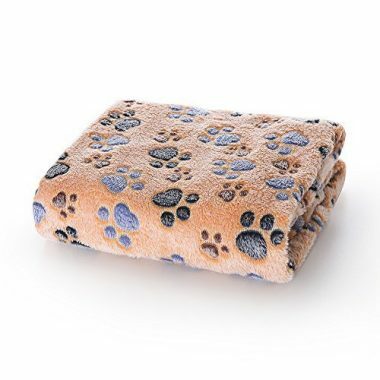 Considered the best dog blanket in town, PAWZ Road comes with ultra-plush and extra-soft coral velvet polyester fabric. Its non-easily piling fabric material is great especially if you have a hound that is very fond of sinking its teeth into the fabric and begin tearing it apart. One also doesn’t need to determine the right and wrong side of the PAWZ Road as either can be used to cover one’s pet or even other surfaces such as dog bed, dog crates, furniture, and even car seat covers. The small quaint prints add a visual element to the otherwise bland sea of fabric that make up the blanket. Because of its rather thick construction, the PAWZ Road can be used for other purposes as well. It comes with a very friendly price tag, too, making it a worthy piece to have to keep your dog warm. Pawsse’s Pet Snuggle is a blanket that is worth considering for the top spot in this list of the best dog blankets. One side is constructed of thick, water-repellent micro fleece that gives pets the warm comfort that they need while protecting the surfaces of your furniture, floor, and upholstery from accidents. The other side of the Pawsse is constructed of Sherpa material which gives it a totally different textural charm. The way in which the blanket is designed helps make it a great complement to existing interior décor while protecting such surfaces from pet accidents. It’s completely machine-washable, too although the current recommendation is hand-washing. 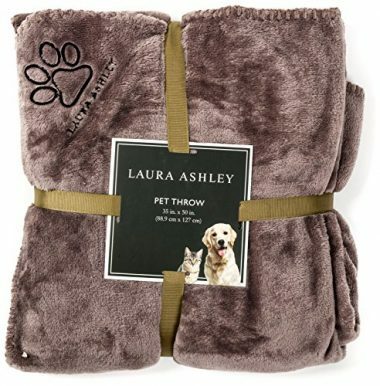 The Laura Ashley Reversible Micro Fur Pet Blanket looks more like a towel than it is a blanket. Its plush and elegant design makes it a very worthy gift for newbie pet parents especially since they are available in 6 colors. One side of the Laura Ashley comes in durable Sherpa fabric while the other side is constructed of micro fur. It’s a lot similar to the Pawsse except that the Laura Ashley only comes in one size. This may limit its usability as it may not adequately cover the body of a giant breed. Nevertheless, its machine-washable design and thoughtful attention to details make the Laura Ashley worth every pet parent’s consideration. The RZA Pet Blanket can be good alternative if one is looking for an all-season and versatile pet bed. It is quite thinner than other products, thanks to its pile-free design. Unfortunately, its relatively thin construction is what puts off quite a number of pet parents who are wary about the overall durability of the blanket. For its size and thinness, some pet parents actually don’t think it is worth its price tag. 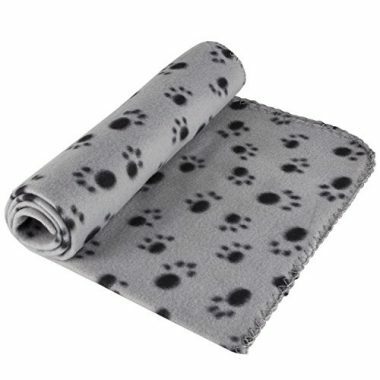 Nevertheless, the paw prints in either white or black color depending on the color of the fabric make for simple decorative elements to the blanket. The refined and reinforced stitching of the Bone Dry DII is one of its best attributes guaranteeing that it will not be easily torn to bits by your canine pet. 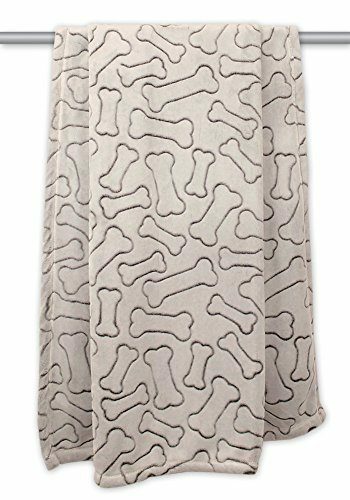 Bone Dry pet blankets are made of 100% microfiber fabric giving hounds the luxury of an ultra-soft blanket they can use to keep them warm on frigid nights. It is machine-washable, too, albeit in cold water. It only comes in one size, though. However, it is still sufficient as it can provide 12 square footage of coverage. It is never really easy choosing a blanket for your pet. Some pet parents actually don’t mind giving their pets hand-me-down or old human blankets. While this is acceptable for most, the fabric may not actually be appropriate for dogs. To help you determine the best possible blanket for your pet you will have to think about the following. Obviously, the dog blankets that you would want to buy should be larger than the size of your dog. Having certain parts of its body exposed to cold temperatures utterly defeats the purpose of having a blanket in the first place. 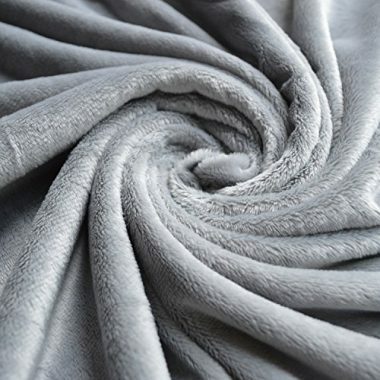 There are blankets that come in a single one-size-fits-all design. Make sure that it will be able to cover the whole body of your pet, otherwise, it’s best to go for a product that can offer you various size selections. Let your dog lie on its side and measure the area that it occupies. This should be your reference when making a dog blanket purchase. There are plenty of materials that can make for a great pet blanket. However, if optimum thermal retention and cold protaretion are what you’re after, then you will definitely go for fur as it has the best thermal retention properties. There are many synthetic or faux fur available today so you don’t need to feel guilty about animals being killed for their fur. Alternatively, wool also has exceptional thermal insulation. Unfortunately, it’s quite expensive and very heavy on your pet. Fleece is always a good option as it is lightweight. Not only that, it can keep your dog warm and comfy, too. The only downside to fleece is that it’s not actually water-resistant. So if this is a real concern for you, you may want to get a fleece blanket with a waterproof liner. Cotton is thick and can provide warmth for your pet. Dogs will always chew. It doesn’t matter if they are mild chewers or power chewers. It’s in their genes. As such it pays to consider getting a dog blanket that will not be easily shredded to bits. For this, you will need a blanket that will not pile as dogs can sink their teeth into these strands and pull them out. You might also want to look at the edging of the blanket if it is double-stitched or is protected from fraying. Most pet parents really don’t like washing their pet’s items by hand. Most also don’t like removing pet fur on blankets or even drying up pet accidents. If these are real concerns for you then it is imperative that you choose a blanket that can be easily thrown in your washing machine and be relatively easy to cleanup with a quick wipe of a clean cloth. If hair is an issue, then get something that will not become a magnet for your pet’s hair or fur. 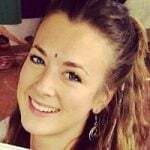 There is this ongoing generalization that pricier products are made of higher quality materials and that cheaper items are constructed of cheap materials. While this may hold water it is still very important to check the material and the quality of a product’s construction rather than relying solely on the price. Experience tells us that sometimes, even the priciest item doesn’t necessarily guarantee good quality. Factor this in your budget. It is easy to see the benefits of using a blanket on our dogs. We can simply consider the many benefits our own blanket provides us and we’ll already have an idea of what it can also do for our pets. However, as it turns out, these are not the only benefits dog blankets provide to pets. Here are a few others. Did you have a favorite toy or blanket that you simply have to have when you were a child? You’d most likely feel anxious and uncertain every time you don’t see or use this toy, right? That’s the same thing with blankets especially if you have a dog that has been using the same blanket since puppyhood. The smell and texture of the blanket gives dogs a sense of security. It’s like they feel a lot safer with the blanket underneath them or covering them. A dog that feels more secure with the knowledge that its favorite blanket is close to its body is a dog that is able to sleep and rest a lot better. As dogs are able to sleep better, they will be able to replenish their energies and feel a lot more energized the following day. Sleep also improves other processes in the dog’s body, improving overall health. This is related to the promotion of a canine’s sense of security. When traveling to an unfamiliar place dogs can feel very anxious. Having their blanket with them can provide them with a sense of security. They know that they are in their ‘safe zone’, that no one is going to bother them. The same is true in other anxiety-provoking situations. The blanket can become a comfort zone for pets. Of course, there is always the warmth and comfort that blankets provide as well as a relative degree of protection for your upholstery, beddings, and furniture, although this is not really likely against spills or leaks. Q: How do I remove dog hair from dog blankets? A: There are several ways in which you can easily remove dog hair from blankets, either your own or your pets. First, there are rollers that come with adhesive backing. Exposing the adhesive surface before rolling it across the blanket should help remove stubborn hair. Alternatively, you can make a ball of adhesive or duct tape with the sticky side towards the outside. Dab the adhesive ball on the blanket until all the hair have been removed. If you have a fleece blanket you can wear rubber gloves. Just lay the blanket on a flat surface and glide your gloved hand on the surface of the blanket. If hair won’t budge, you may want to wet your rubber gloves in plain water before running it across the blanket again. You can also use a dryer sheet and rub it across the surface of the blanket. The static electricity it generates should help remove the hair from the fabric. Q: What size of dog blanket should I pick? A: As previously mentioned, the size of your dog is one of the major considerations when choosing a dog blanket. It should be able to cover the body of your pet. Additionally, you may also want to consider the size of your pet’s bed or crate if these are the items that you are going to use the blanket in. Ideally, it should always be bigger than the area being covered. Q: Why do dogs chew on dog blankets? A: Canine experts say that the most important reason why dogs tend to chew on blankets is that they were abruptly removed from their mothers at a very early age. In other words, they were not weaned properly and gradually. Puppies have this inherent need to suckle and nurse on their mother’s breasts during the first 3 to 4 weeks of their lives. If they are abruptly removed from the suckling activity, this has the tendency to manifest as destructive chewing in later life. Another reason why dogs may chew on blankets is that, as puppies, they found chewing on soft things can soothe their teething problems. If they were not given dental chews to help soothe sore gums, they’d eventually find chewing on their blanket as a good alternative. Sadly, they carry this behavior when they grow up. Adult dogs that were never known to have chewing concerns as puppies and then suddenly developed a knack for chomping on fabric can have serious separation anxiety issues or any form of canine anxiety. it is through chewing that they are able to vent their frustrations and use up all the negative energy associated with anxiety. 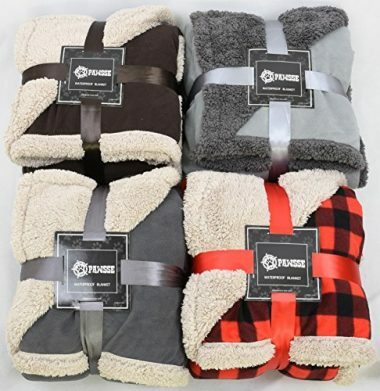 Picking the best dog blanket was never easy as almost every single product came with exactly the same features especially the materials used in their construction. If there were differences these were mostly related to the presence (or absence) of decorative elements, sizes, and prices. We narrowed down our selection to the top three namely, PetFusion’s Micro Plush, PAWZ Road’s Fleece Fabric, and Bone Dry’s DII Microfiber. Bone Dry would have been an easy choice except that it only came in a single size. PetFusion addressed this limitation, providing pet parents with 4 different sizes to choose from. Additionally, its reversible features make it a worthy blanket for dogs. Unfortunately, it only came in one plain color – slate gray. This brings us to the PAWZ Road. This third contender comes in 3 sizes and 3 different color design options. It is also priced lower than the other two contenders. It also enjoys the accolade of more pet parents. When it comes down to keeping pets warm and cozy, it does a great job, too. 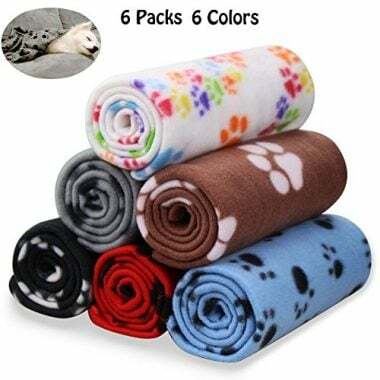 For its friendly price, ample selection of color designs and sizes, pet warming capabilities, and multi-purpose design, the PAWZ Road Fleece Fabric Soft and Cute Pet Dog Blanket ultimately earned our nod as the best dog blanket in the market today. 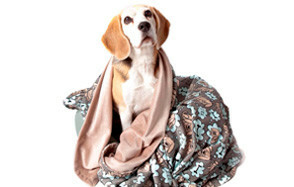 Dog blankets offer a cozy solution to dogs that are easily susceptible to cold temperatures. And while there are other ways in which pet parents can provide warmth to their dogs, blankets have a special purpose as promoters of canine sense of security. That being said, our list of the best dog blanket should help you zero-in on the most appropriate piece of comfort fabric for your hound. Do Dogs Dream? What Do They Dream About?